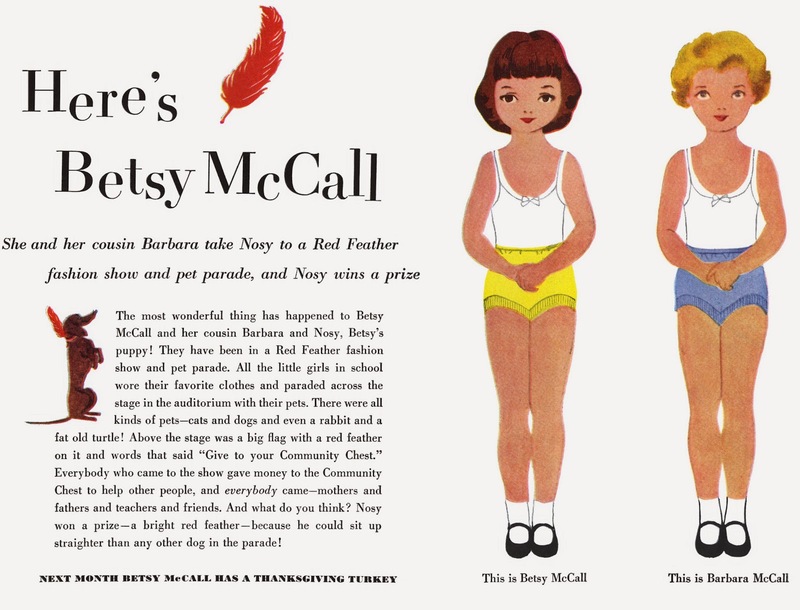 Starting in May of 1951, McCall's Magazine added the feature of Betsy McCall paper dolls. They were feature nearly monthly in the magazine for 40 years. The ones that were holiday themed are my favorites. 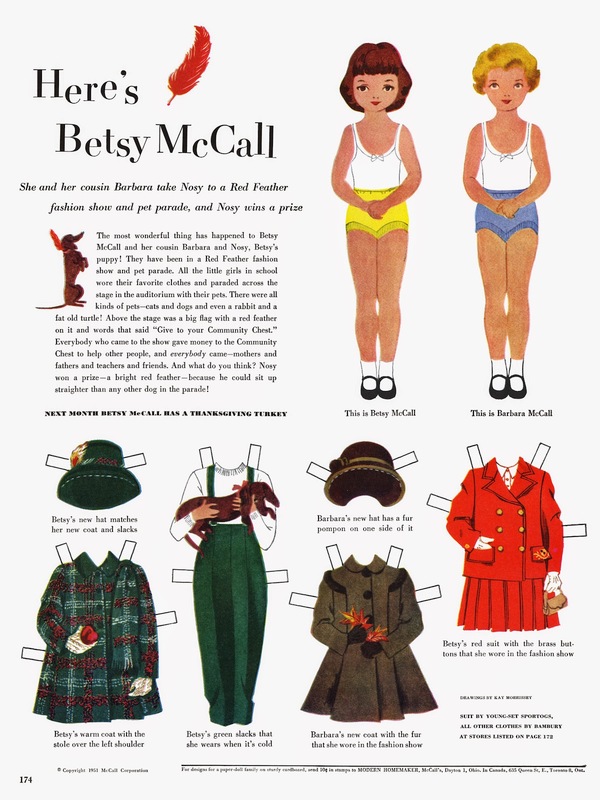 The Betsy McCall's paper doll proved to be hugely popular for the magazine. There were a line of actual doll's issued afterwards by Ideal. I prefer the 8 inch dolls from the vintage Betsy line. (They were similar to those small Madame Alexander's.) The Betsy dolls were little hard body, jointed dolls that had beautiful faces. These dolls are still being produced, in a collector's series. 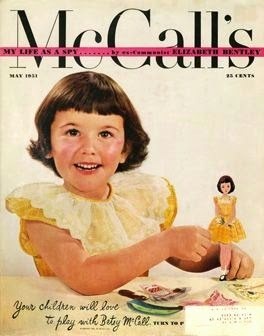 But there have been many other versions of paper dolls sold with the Betsy McCall name. So there were other options to obtain them, besides the magazine. image from here... and she is looking for a new home!!! 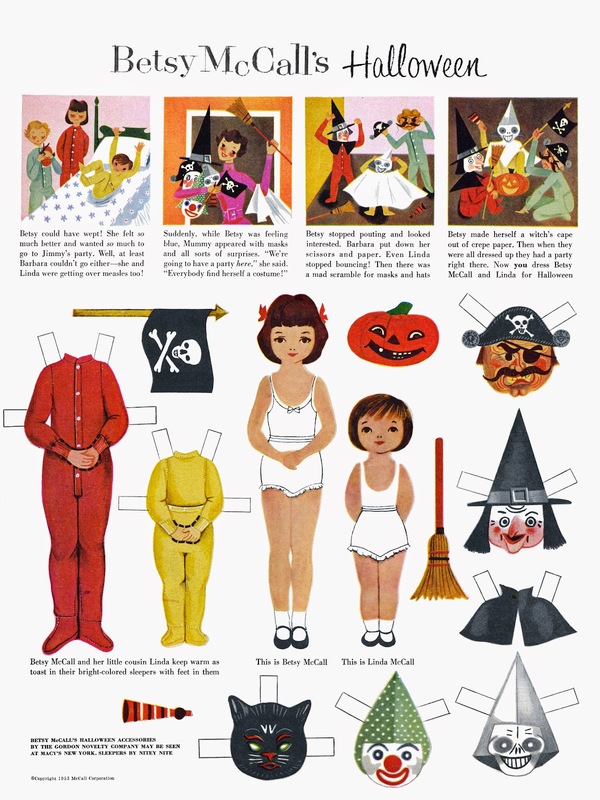 The paper doll from that first year, for the month of October 1951... was not Halloween themed. But they did feature her dog, Nosy! Along with Betsy's cousin, Barbara McCall. Gosh, I used to love paper dolls when I was a little girl. This may be why I'm so handy with scissors now,lol. I was always fascinated with the vintage paper dolls from the 50's-60's. When they were glamorous looking. My great grandmother kept a pile of them in her house to play with, when I was a child. They had been ones that belonged to older cousins of mine. I wish I had manage to bring them home. She had those amazing Elizabeth Taylor's ones in that pile!